Bank aims to educate under-25s on keeping personal data private. Santander has created an "invisible cinema" activation to highlight the importance of keeping banking and personal data private. The brand is travelling around the country to a number of cinemas to target young adults with the experience, for which visitors will need to put on a pair of "special" glasses to view a trailer. Santander removed the polarisation filters from the high-definition LCD screens to make them appear blank to the naked eye. The filters were then used to create the glasses to make the cinema screen appear. The campaign follows Santander’s research that found 42% of 18- to 24-year-olds have shared online banking passwords and 85% have shared details on social media that could be exploited by scammers. "For your eyes only" kicked off yesterday at the Regent Street Cinema and will be visiting Brighton, Exeter and Sheffield Hallam universities and University College London. Chris Ainsley, head of fraud strategy at Santander, said: "Today’s under-25s have grown up online and spend a great deal of time using devices and social media. However, it’s evident that one of the pitfalls of their online lifestyles is a culture of oversharing and being careless with sensitive information – and this is leaving them highly vulnerable to scams and fraud. 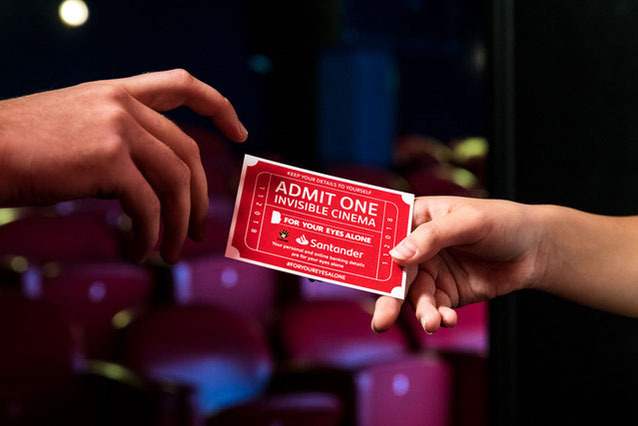 "Our invisible cinema events are an innovative and entertaining way of raising awareness among this age group of the importance of keeping online banking details, passwords and personal information completely secret and for their eyes alone."